I’m sure baseball minor leaguer Brooks Marlow never expected to be compared to Donald Trump. I’m sure Trump never expected to be compared to Marlow. But if Trump is adamant that “this was just locker room talk…they’re just words” as he told the nation at the second Presidential debate, then we need to change the narrative of locker rooms, metaphorical and literal, immediately. The classic Tweet, delete and apologize strategy. As reported recently, ESPN baseball reporter Jessica Mendoza has been receiving quite a bit of flak from some pretty unrefined folks simply for being a woman giving commentary on professional baseball. I don’t want to give any of these comments repeat press, except one. 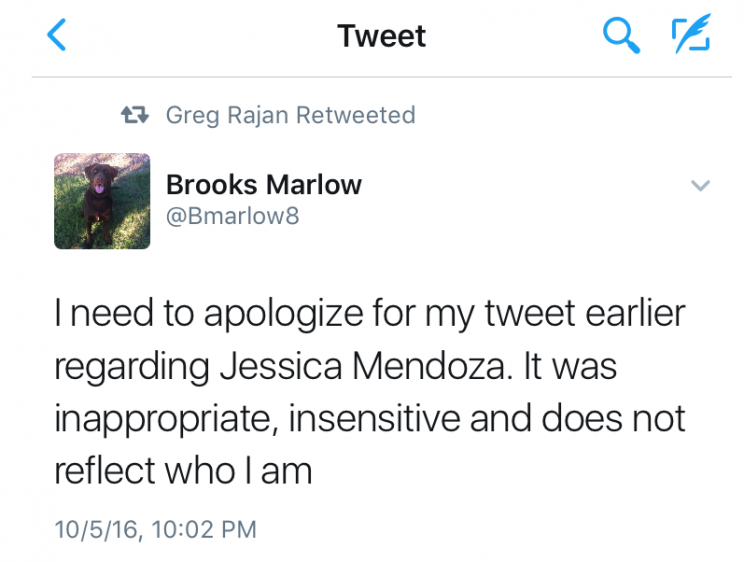 On October 5, Houston Astros player Brooks Marlow tweeted, “No lady needs to be on espn talking during a baseball game – specially [sic] Mendoza sorry.” And then he deleted it. The problem is, he’s not sorry. This is the internet equivalent of “No offense, but…” If a person has to finish any tweet with “sorry,” they shouldn’t be tweeting it. That same lesson can be applied to the immediate Tweet delete Trump has become so famous for, among some other unsavory things. Tapes recently surfaced with audio from a 2005 conversation he had with Access Hollywood Host Billy Bush regarding Bush’s co-host, Nancy O’Dell. The classic say something horrible and blame the world strategy. If this country is truly to “become great again,” it happens by teaching civility and respect. It begins by being role models for each other, and surrounding ourselves with the same. To quote Michelle Obama: “When they go low, we go high.” Go higher than Trump and Marlow, folks. We’ll bring the rest of the country up with us.